Earlier this year, Indonesia’s national parliament passed a law that tried to curb dynastic succession in politics. This was frankly a little surprising. The chairwoman of the largest party in parliament, Megawati Sukarnoputri, is the daughter of Indonesia’s first president. Though she never did manage to get elected herself, Megawati did spend some time in the top job after her boss President ‘Gus Dur’ was impeached. After a bit of political arm-twisting, her own daughter now sits in the cabinet. It’s hard to imagine either of these woman getting their jobs on their own intellectual merits, which are generally agreed to be slender. The same is true of a number of the wives, sons, nephews, sisters-in-law and other sundry relatives of former provincial governors and district heads who have been elected to replace their loved-ones in important executive posts around Indonesia — over 50 of them in all. In some areas of Indonesia, prominent families are entrenching themselves in power so effectively that the archipelago is looking a lot like it did before the Europeans arrived five centuries ago — a necklace of quasi-independent but interlocking Sultanates in which power and bloodlines were synonymous. Lawmakers at the national level are worried enough about this that in March they made it illegal for anyone to step straight into a district head, mayor or governor’s seat if they are directly related to them by blood or marriage. Parents, children, siblings, spouses and in-laws would have to wait until at least one (five year) term had passed before they could be elected to replace their relative. That was before the constitutional court had its way. Ruling earlier this month on a case brought by the munchkin son of the head of Gowa district in South Sulawesi, the court said the restriction violated every Indonesian’s right to run for office. The munchkin’s uncle, “Komandan” Syahrul Yasin Limpo, looked on with satisfaction from his post as Governor of South Sulawesi. 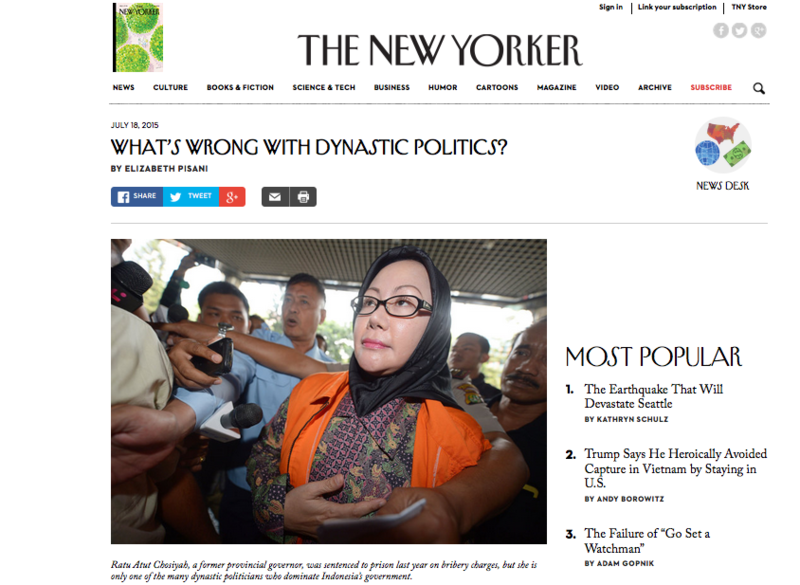 In this essay in The New Yorker, I muse on why political dynasties are more dangerous in Indonesia than they are in the United States. It boils down, I think, to the lack of an independent judiciary that might provide an effective constraint on the octopus reach of family connections into all of the institutions which are supposed to provide checks on the local executive. There’s something else at play too, though — the networks of patronage which both produce and benefit from dynasty politics are simply more deeply embedded in many of Indonesia’s cultures than they are in the United States. I’ve been thinking about this a lot in the weeks that I’ve been happily ensconced as a visiting fellow at KITLV, or the Royal Netherlands Institute of Southeast Asian and Carribean Studies in Leiden. I’m especially fascinated by the work of Ward Berenschot, who is actually trying to quantify different levels and patterns of patronage politics across Indonesia. He’s found, not all that surprisingly, that what he calls clientilism runs thicker in clannish areas of Eastern Indonesia than it does in Java (with the exception of Banten, where Ratu Atut Chosiyah has established herself as Grand Misstress of patronage politics). I look forward to seeing more of the results of his work as they emerge. Why are Indonesian politicians such slow learners? Where have all the oknum gone? Be the first to comment on "My dynasty’s bigger than your dynasty: Indonesia beats the US at patronage politics"